This Safeguarding Statement applies to all who make up the church ‘workforce’ which includes all clergy, holders of Bishop’s licence or permission, those commissioned or authorised by the Bishop, those, paid or unpaid, who hold positions of responsibility in a parish and work with children or vulnerable adults, and those with representational parish ministry, for example; churchwarden, organist, server & choir members. For the purposes of this document the term ‘Parish’ is used to denote the PCC and Incumbent who are together responsible for ensuring that diocesan safeguarding policies and procedures are implemented. For the purposes of this document a child is anyone under the age of eighteen years. The Thundersley PCC has adopted the Diocese of Chelmsford Safeguarding Policy 2014.A copy of the full relevant policy is obtainable on the Diocese of Chelmsford’s website www.chelmsford.anglican.org/safeguarding and a hard copy is kept accessible in the church office. The Parish Safeguarding Representative at St Peter’s and St Michael’s is Rev Susan Croucher and has been appointed by the PCC. 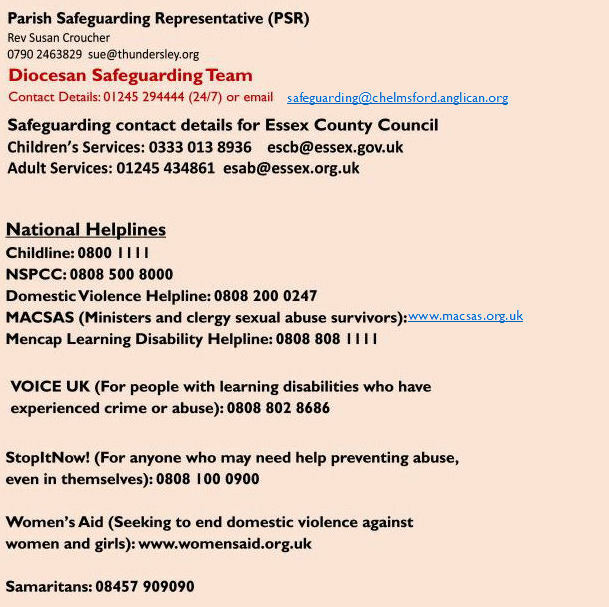 Formally adopt the Diocese of Chelmsford Safeguarding Policy. Invite our PSR to attend at least one PCC meeting each year. At this meeting the PSR will provide a report on Safeguarding for the parish. Ensure that all those authorised to work with children and vulnerable adults are appropriately recruited according to safer recruitment practice and are adequately supported. Ensure that all those authorised to work with children and vulnerable adults are trained appropriately for their roles, including Diocesan Safeguarding Training. Provide appropriate insurance cover for all activities undertaken in the name of the church, which involve children or vulnerable adults. Ensure that an Activity Plan and Risk Assessment is completed and reviewed (at least once a year) for each activity, which is associated with either children or vulnerable adults and run in the name of the church. Comply with Data Protection Principles – specifically with reference to storing information about the ‘church workforce, including volunteers, who have completed a confidential declaration and/or undergone DBS checks and for Safeguarding Agreements of offenders and others who may pose a risk.